Send them happy birthday wishes in style with this celebration in a basket! Your selection of premium Champagne is paired with a generous collection of savory fare and sweet confections, designed to send a perfect birthday toast. Your selection of Moet & Chandon Brut Imperial Champagne or California Sparkling Wine. For more information on these Champagnes, please see the Tasting Notes. Ghirardelli Intense Dark Chocolate, Godiva Dark Chocolate. Godiva Chocolate Cashews, Chocolate Cherries and more. Each gourmet item is carefully assembled, and the gift is accentuated with a hand-tied satin ribbon imprinted with "Happy Birthday". A free card is included with your personal message or greeting, as well as complimentary scissors so your recipient can easily open their gift. Your gift will leave a lasting impression as they continue to enjoy this elegant keepsake leather serving tray with hand-stitched leather trim. Measures 14" x 8" x 8". Birthday Wishes Champagne Gift Basket is a hand delivered gift. These gifts are delivered by one of our local design centers located throughout the United States and Canada. Same day delivery is available for most gifts when ordered before the cutoff time. 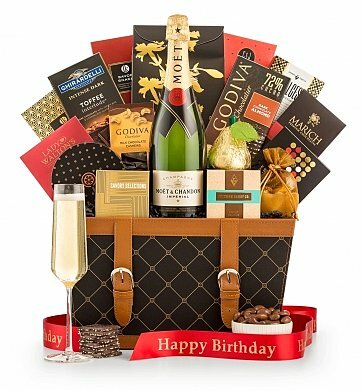 The cutoff time for Birthday Wishes Champagne Gift Basket is 2 PM in the recipient's time zone. Chocolate Pomegranate TrufflesA chocolate pomegranate cream center is enrobed in rich milk chocolate, creating a decadent truffle that's exclusive to GiftTree. Ghirardelli Hot Chocolate MixThe luxuriously deep flavor of Ghirardelli Premium Hot Cocoa starts with cocoa from the finest cocoa beans. Moet & Chandon Imperial ChampagneA luxurious, world-famous Champagne that boasts soft white-fruit aromas of peaches and pears and a finish of fresh walnut. Dunlin California Brut Sparkling WineDunlin Brut offers a crisp, full bodied glass with a fine bead and aromas of floral apple and cinnamon toast. Flavors of green apple and citrus develop into rich complexity and fine mousse. Dunlin Brut offers a crisp, full-bodied glass with a fine bead, aromas of floral apple and cinnamon toast. Flavors of green apple and citrus develop into rich complexity and fine mousse. Brilliantly balanced and deep; this is a fresh and tangy wine made in the exacting methode champenoise. A luxurious, world-famous Champagne that boasts soft white-fruit aromas of peaches and pears and a finish of fresh walnut. The smooth, juicy mid-palate segues to a clean, crisp finish ideal for sipping with a decadent truffle course or raising to toast a momentous occasion. Your selection of Moet & Chandon or Fils Gallant. Gourmet Chocolate from Ghirardelli, Godiva and more. Arrives in GiftTree signature keepsake basket with buckle accents.